Nick, the son, has been christened like his grandfather and it is because of him that pigeons were housed for the first time in their family house. But this time, this combination is not only a father & son team because the mother/wife is also involved into the management of the pigeons. Nick found the way to the pigeon loft since his childhood and he liked to spent his free time into the loft of his grandfather. His father Roger and his mother Godelieve decided then to built him a small loft in their garden and this is how everything started. Almost twenty years ago, they received a full round from their neighboor Geert Lambrechts and this is when everything went on the right track. Now that the time has passed by, all the tasks related to the practice of their hobby are well distributed between all the members. Around his 18th anniversary, Nick started to get interested in various other things but it was too late as his parents were already hit by the pigeon bug. Everybody takes so much pleasure with the practice of the pigeon sport that it would be impossible to live without it now. After a few years, Nick found back his way to the lofts. But now the situation has changed and the daily cares are the business of his parents. Nick helps during the basketting and during the arrivals of the birds. He also spent time doing the pairings and helps when it is needed. "Our Witte 06 and our Orleans-duivin are currently the basic pigeons of our lofts", explained us Nick. "We are currently working with their fourth generations and they still deliver us some great performances." The Witte 06 comes from the Portier and one of our best breeding hen, Salien. Both pigeons were part of the first generation of good pigeons who flew at Thys. That's why we find back the blood of Geert Lambrechts. Click here to check the pedigree of the Witte 06. The Orleans-duivin, BE10-6178954, won the provincial race of Orléans against 2402 pigeons. Her father is a direct Dirk Van Dyck while her mother, the 'Goe Zwart', was a super racing hen in the middle distance races. Click here to check the pedigree of the Orleans-duivin. The small basket used by Roger and Nick has contained some heavy performers until now. A view on the aviary of the breeders. 57. Prov. Blois 2596 p.
57. Prov. Argenton 3699 p.
51. Nat. Châteauroux 25.710 p.
37. Nat. Argenton 2418 p.
322. Nat. Bourges 21.522 p.
361. Nat. Bourges 14.496 p.
Click here to check the pedigree of 'Het 445'. 20. Nat. Bourges 38.456 p.
77. Nat zone Guéret 1413 p.
97. Prov. Blois 2596 p.
The Klein 06 is not a stranger as her mother, the BE10-6178954, won herself the provincial race of Orléans against 2402 pigeons. Her father is the BE14-6274417, a son of the basic hen 'Salien' BE06-6111045. Click here to check the pedigree of Klein 06. 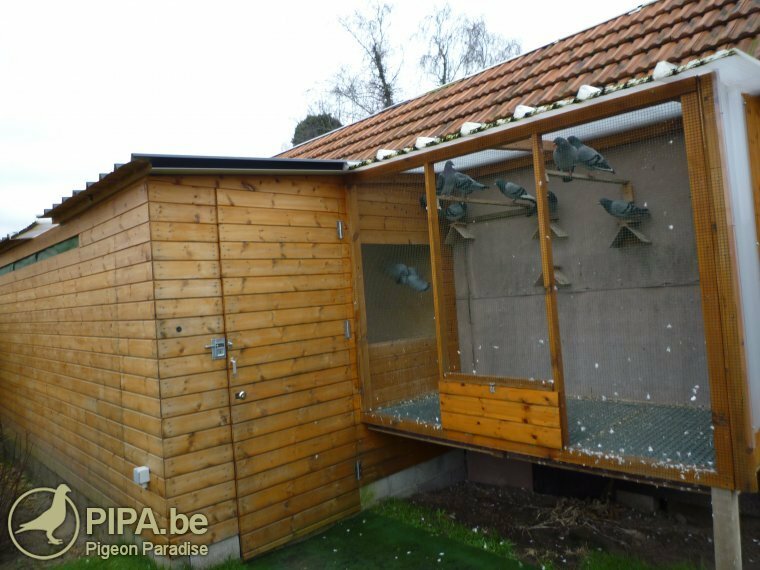 In Hallaar, the pigeon sport is a family business and the Thys's are real fanciers who enjoy each day spent in their lofts to take care of their pigeons. Over the last few years, their performances were better and better but it changed nothing to their life, finally. Ambition is a necessity but they still have the same philosophy and they only race with a handful of pigeons. Pedigrees are not the most important things for them. Only a few pigeons were taken into pictures. But the biggest pleasure they always had, these are the results and it has been always a constancy. They want to stay small pigeon fanciers, racing with small amounts to keep control but you can be sure that when they stand on the table on a basketting day, it's always to try to book a victory.